Are you seeking skip hire in Collier Row? We understand how difficult it can be to find a skip hire provider who has an impeccable reputation. However, with us, you don’t need to worry. Away With It are fully licensed and insured, so get in touch today to find out how one of our expert teams can help you with no-fuss skip hire. Why Choose us for Collier Row Skip Hire? After years in the business, Away With It run like a well-oiled machine, and all of our staff are friendly and ready to lend a hand. We are one of the most established and reliable firms in the area, and we get a lot of customers recommending us to their friends and family. We arrange delivery and collection times with you, guaranteeing you a specific time slot so you have the freedom to get on with your day. You know confidently when we will arrive and, just to make sure, we will always give you a quick ring to let you know we are on our way. You won’t be left waiting around with Away With It, we are sticklers for seamless service. What makes us stand out from the crowd is our incredible flexibility. We know you have better things to be getting on with than taking time off work to load a skip. We are open from 7am until 11.30pm, meaning we can arrange your skip hire service to fit in with your day. No matter how busy your weeks are, we will always be able to accommodate you. When we arrive, we won’t just dump a skip on your doorstep and sidle off. We are renowned for our customer service and we will be there to ensure you are happy with the service throughout. If you are having any problems, we are only a phone call away, and we can be on the road and ready to lend a hand! We genuinely care about our customers at Away With It, and we often see customers using our services repeatedly. Our team are close-knit, and we like our customers to feel like part of the inner circle too. If you’re settled on our skip hire service, that is fantastic. However, we also offer a second service which often achieves the same result, but for less budget. Our hard-working and friendly teams of two will tell you to pop the kettle on, not for themselves, but for you. You don’t need to lift a finger when our team arrives. Settle yourself in from of the TV and let us handle all the hard work for you. You don’t need to worry about any mess, we always tidy up after ourselves. Whatever you need getting rid of (builders waste, garden refuse, household junk) we will simply load it into our truck and get it out of you way. Some properties do not have the space for a skip, and sometimes, the necessary giants can look a little rough around the edges. With our waste removal trucks, you won’t need to have a skip sitting outside your house, we will simply remove you waste, and get on our way. No waiting, no fuss! Whatever the weather, our friendly teams are on the roads of Collier Row daily. If there are piles of waste and clutter that are driving your crazy, you know the Away With It team will be there to help when it suits you. All our quotes are provided free and without obligation, and we will always suggest the most cost-effective solution for your needs. In many cases, if you are happy with your quote, we can come and collect the same day if it suits you. 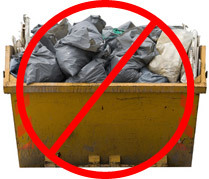 It has never been easier or cheaper to hire a skip and get rid of waste. Get on the phone to our friendly team via 0208 504 7390. Have a chat and discuss your requirements and we can get the ball rolling to get rid of your waste in Collier Row.